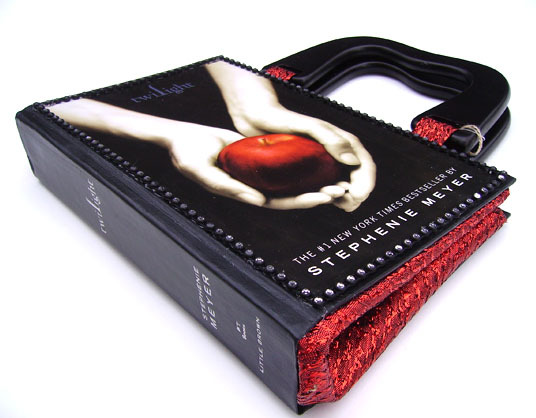 Look at this--you could have your very own Twilight purse! I'm sure there are a few million teenage girls who would love to open that up as a gift; and that's what Michelle Pulis, owner of A Spoonful of Chocolate Hope, hopes, too. At her online store, she sells these super-cute handmade book handbags, bookshelves, book passport holders, and chocolate stirring spoons. And she started her company to help her family! So, we're interviewing Michelle today to get the full story on the cutest purses around and the reason for starting her business. WOW: Welcome, Michelle, to The Muffin. We are thrilled to have you with us today. Why don't you start out by telling us a little about your business, A Spoonful of Chocolate Hope. What types of products do you make and sell? Michelle: Everything you see in my shop is made by hand! I originally started my shop making chocolate stirring spoons for your coffee. However, that idea backfired in the sweltering Arizona heat, and I ended up changing my product completely to making and selling handbags created from used books. Initially, I would just donate the pages to a local refugee placement committee here in Arizona; however, I noticed many of my customers also wanted the pages. 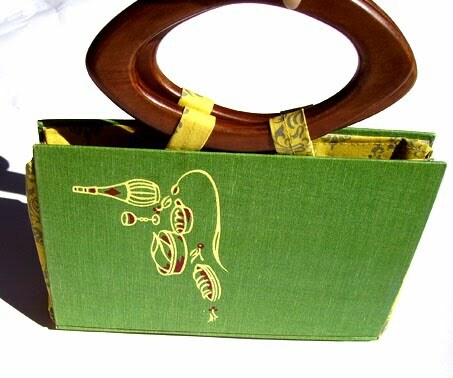 So, I started giving the buyer's the option of re-binding the book with the matching fabric used for th e handbag to make a unique gift set! Another product I offer is passport holders/wallets disguised as books to keep the pick-pocketers away while traveling. And my newest product is making a bookshelf out of used books. It makes a great addition to any home library. WOW: So, you create handbags made out of books? What an awesome idea! They are super cute and great for book lovers, but how sturdy are these? Michelle: Very sturdy actually! I have tested the purses for sturdiness and quality. Each book is made from a good quality recycled book. I put finish on it to prevent any rips and tears. I have been carrying around my book handbag for about a year now and have had no problems whatsoever! WOW: That's great to hear that the products are cute and sturdy! Why did you start your company? Michelle: Spoonful of Chocolate Hope was created to help my father save his house. It's a long story, so I'll try to make it as short as possible. My father is a simple man who immigrated from what is formally known as Czechoslovakia in 1969, searching for a better life. Growing up, I watched him build our house with his own two hands, constantly adding things that reminded him of Czechoslovakia. A couple of years ago, my mother's brother (Frank) asked for my father to co-sign a loan for a business he was starting. My father wanted nothing to do with it; he had worked hard to get out of debt and didn't want anything in his name. My mother and uncle constantly asked about the loan, until my father finally gave in. Uncle Frank is now basically homeless; his business has gone into bankruptcy and is now unable to pay off the loan. My parents are now forced to pay $3,000 a month with a combined income of $27,000 a year. So I created this site to give my parents 100% of the profits. Wanting to give my father back some of the life he worked so hard on achieving. WOW: What a great reason to start your business. Not only do you offer a unique product, but it's also for a fantastic reason. So, you have to be an awesome time manager because you work a full-time job, and you come home and make all your products for customers by hand! Give us some tips. How do you do it? WOW: It's easy to see that you are very dedicated to your cause and your business. It reminds me of the saying, "Where there's a will, there's a way." I think some of us, as writers, can learn from your time management skills! That's for sure. Why do your book handbags and other products make perfect gifts for family and friends? Michelle: Because they're so personalized! You don't even have to like to read. Just think of a hobby your loved one has, and I can find a book related to it. I have made cookbook handbags for the chefs of the house, Van Gogh book handbags for the artists, Atlas briefcases for the World travelers. . .and the list goes on! WOW: Those are great examples! What are your future plans for us to look forward to? Michelle: I'm actually hoping to start making table lamps out of books, and maybe even branch out to furniture and start making side tables out of books. I always have something brewing in my head! WOW: Thanks, Michelle, for talking with us today! Okay, women writers, we know you love books, so if you want to check out all that A Spoonful of Chocolate Hope has in store, visit here!